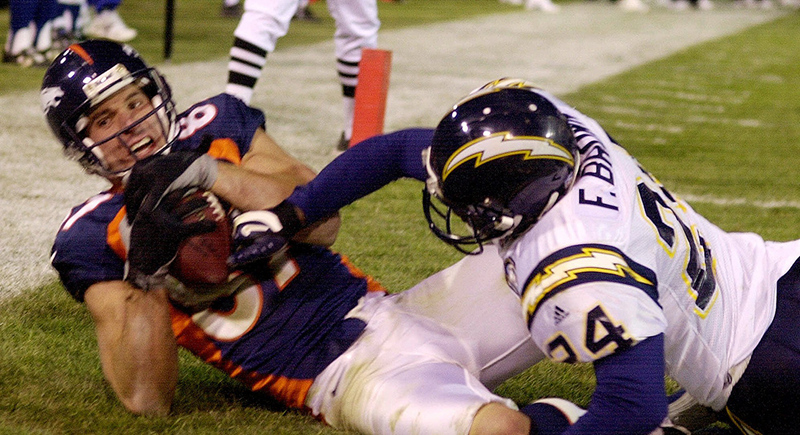 Denver Broncos wide receiver Ed McCaffrey, left, pulls in the winning 5-yard touchdown pass from quarterback Gus Frerotte as San Diego Chargers cornerback Fakhir Brown, right, defends in the fourth quarter Sunday, Nov. 19, 2000, in Denver. Denver beat San Diego 38-37. The Broncos improve to 7-4 with the second-largest fourth-quarter comeback in franchise history, overcoming a 34-17 deficit to beat the San Diego Chargers 38-37. Quarterback Gus Frerotte, replacing the injured Brian Griese, broke Frank Tripucka’s 38-year-old franchise passing record (447) with 462 passing yards and tied the team record with five touchdown passes.